Spring. 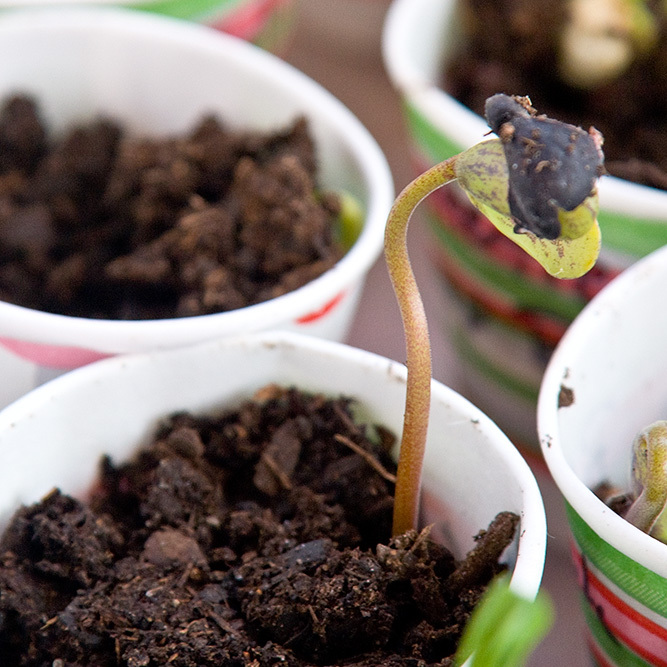 Our family chose to celebrate its coming by planting some of the seeds for our garden. We had planted a few slow growing herbs and a couple of tomatoes in traditional black plastic seed flats last month, only to have them raided and pillaged by our seven-month-old kitten (furry so-and-so). Before The Seedling Incident, I had noticed that planting mixed flats was going to be a problem, as the tomatoes quickly outgrew the herbs. So, I decided to try a new method, using the smallest paper cups I could find, and putting them into clear, locking plastic bins. My kids are city kids, I think I’ve mentioned this? Most of the time I forget, but every once in a while they remind me. This was one of those occasions. 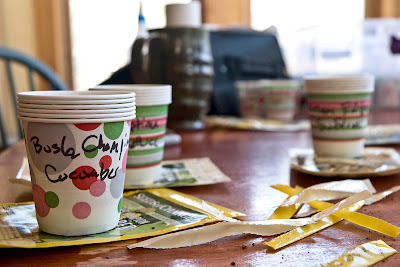 I labeled each cup, and Shawn mixed up a large bowl of organic potting soil and water. He’s really good at getting the moisture content just right. 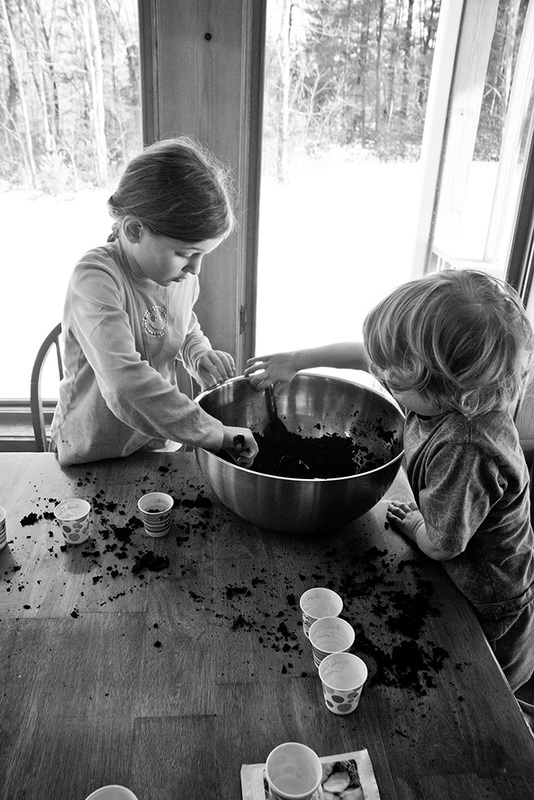 We put the big bowl of dirt, the little paper cups, and some big spoons on the table, and encouraged the kids to jump on in. They expressed some skepticism. 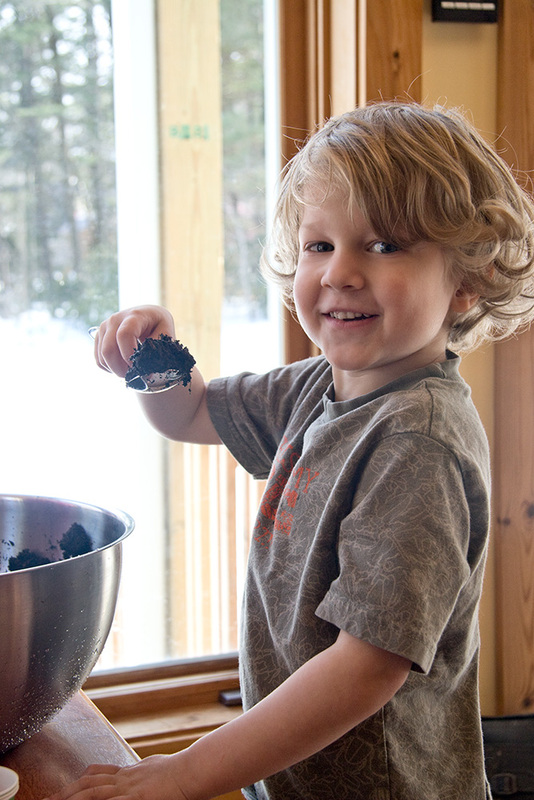 Jason was firmly convinced that the substance in the bowl was mud, and simply should not be touched. Understandably, I goggled at this piece of news, having washed his person and clothes all last summer, when he didn’t seem to have any such reservations. Susan was most concerned that she get the level of dirt in each cup exactly right. But dive in they eventually did, called by the siren song of dirt, and buoyed by their parents’ permission to spread it all over the dining room table and floor. Cups were filled, seeds were admired and carefully counted, handled gently as the precious things they are. The children’s faces filled with awe as the amazing variety of shapes and sizes, from the tiniest smooth lettuce seed to calendula, large, curled, and spiny, like some amazingly ancient fossilized sea creature. Every seed was carefully tucked into its cup, and lovingly covered with just the right amount of soil. Well, ok, some of them were vigorously covered. Each large clear box was carefully filled with cups, locked, then placed under the windows. And the children waited. Pawnee Shell Beans, which are large, plump, and speckled brown and white. It is a reality changing thing for them to understand that the peas and beans we eat are also capable of bringing new life into the world. Jason hops up and down, talking about catsup. He puts it on everything, and shows nothing but excitement about the idea of making it, rather than buying it in a store. I’m not sure this flush of excitement of his will carry him through the process of first cooking, then canning, but I know better than to take this away from him. I do not express doubt, understanding that sometimes passion is what sustains us through the harder things in life, and that pleasure and pride can be found in a hard job well done. Even for little boys. Susan is planning pickles. Bread and butter pickles, thank-you-very-much, and not half-sour. I nod, and say yes, wondering where on earth I’m going to find a bread and butter pickle recipe that doesn’t call either for cane sugar (to which three of us are allergic) or corn syrup. Somehow I’ll manage, and feed this fire that has been kindled in them, this passion for food and the magic of growing things. Every day they sit by the boxes, and every day I open them. Every day we catalog what has come up since the day before. They never get tired of it, they can sit there and look at the precious seedlings for hours, dreaming of pumpkins, beans, peas, and flowers, of hot summers, and the pleasure of eating their own watermelon. I can’t help but feel that, yet again, this is the healing of a connection broken and lost. And I know deep down that this is a world changed for them, that even if we never plant another seed, they will always feel this magic in their bones. That they will always hear it, the siren song of dirt.